See www.kahunasurf.co.za/kp/earthwave-2010 for or the Facebook group Earthwave Beach Festival 2010 for further information and a gallery of images. The 2010 Mr Price South African Junior Surfing Championships featuring nine teams of the country’s top junior boys and girls gets under way in the Southern Peninsula with the opening function in Kommetjie today ( Monday September 27). The 250 or so surfers participating in the 15th edition of this premier Surfing South Africa tournament represent eight provinces and include a team of surfers who will compete for the South African Development Academy Team. The Cape Peninsula last hosted the South African Junior Championships in 2002 and this year’s event will be only the third time in 15 years that the tournament will take place in the Cape. From 1996, when the first SA Junior Championships took place in a rain soaked Durban, to 2003 the team from Central KZN dominated the championships winning eight team titles in a row. In East London in 2004 Western Province broke the chokehold the Durban surfers had on the title and claimed the first of their four victories in a row. In 2008 at St Mikes, Central KZN reclaimed the crown from WP by the narrowest of margins and then defended the title in style at Nahoon Reef in East London last year. Western Province has won every national championship held in Cape Town since 1966 so there is plenty at stake next week as the WP class of 2010 fight hard to maintain that tradition and keep the Freedom Cup in the Cape this year. Apart from WP and Central KZN, Eastern Province, last year’s hosts Border and WP’s next door neighbours Boland all have plenty of strong surfers across the divisions. Southern KZN will be one of the most significant teams at this year’s contest as their side clearly shows the success of their transformation programmes. Southern Cape, Zululand and the South African Junior Development Academy Team, which is supported by Sport and Recreation SA, make up the balance of the competition. The opening function of the 2010 Mr Price SA National Junior Championships takes place at 7pm on Monday evening in the Kommetjie Primary School. The heats get under way at 8.30 am on Tuesday and the finals and Award Ceremony will take place on completion of the last Final on Sunday October 3. Surfing South Africa is recognised as the governing body for the sport by the SA Sports Confederation and Olympic Committee (SASCOC) and Sport and Recreation SA. Surfing South Africa is a member of the International Surfing Association (ISA), the world’s governing body for surfing. CULS NUS BEACH, Hossegor/France (Sunday, September 26, 2010) –Day 1 of the Quiksilver Pro France experienced the full range of conditions that French beachbreaks are renowned for, completing the twelve heats of Round 1 in everything from slabbing barrels to high-performance peaks. Stop No. 7 of 10 on the 2010 ASP World Tour, the Quiksilver Pro France continued the race for the 2010 ASP World Title as well as the requalification campaigns of the world’s best surfers in spectacular fashion today, with dramatic tuberiding and horrific wipeouts taking center stage. Mick Fanning (AUS), 29, reigning ASP World Champion and defending Quiksilver Pro France Champion, was a standout this morning, netting the highest single-wave score of the day, an 8.33 out of a possible 10, with an excellent forehand barrel. Currently ranked No. 5 on the 2010 ASP World Title Race rankings, the calculating Australian will look to repeat his form from 2009 in order to mount an ASP World Title defense. Jordy Smith (ZAF), 21, current ASP World No. 2, surfed a solid Round 1 heat this morning, dispatching of Luke Stedman (AUS), 34, and Julian Wilson (AUS), 21, with a flurry of barrel rides. Well in the hunt for the 2010 ASP World Title, even temporarily holding the ratings’ lead following the fifth event in Africa, Smith is cautious when discussing his aspirations for the remainder of the year. Patrick Gudauskas (USA), 24, 2010 ASP World Tour rookie and current ASP World No. 23, caused a major upset this morning, relegating former nine-time ASP World Champion and current ASP World No. 1, Kelly Slater (USA), 38, to the elimination Round 2 following their opening round bout. The young Californian began his campaign in spectacular fashion, threading a deep forehand barrel before executed a lofty double-grab aerial. Following a disappointing 25th place finish at home in California last week, Gudauskas was elated to put that behind him and begin his European leg campaign in fine fashion. Owen Wright (AUS), 20, 2010 ASP Dream Tour rookie and current ASP World No. 8, continued to his excellent run through his rookie year on tour, posting the day’s highest heat total, a 14.13 out of a possible 20, for a commanding performance on the lefthanders. Jeremy Flores (FRA), 22, current ASP World No. 21, rebounded sensationally in the opening heat of the day, recovering from a challenging start to take the win in the final moments. The young Frenchman was unable to penetrate the powerful shorebreak on his first attempt, but after collecting himself on the sand, made a second charge successfully and tenacious scored the winning wave in the final minute of the heat. The lone Frenchman amongst the ASP Top 34, Flores holds the weight of expectations for an entire nation on his shoulders and appreciates the opportunity to represent his country. When competition resumes, up first will be Kelly Slater (USA), 38, up against Maxime Huscenot (FRA), 18, in the opening heat of Round 2. Event organizers will reconvene tomorrow at 8am to assess conditions for a possible 8:15am start. The Earthwave Beach Festival got underway in sunny skies and light onshore winds at Surfer’s Corner in Muizenberg today with the opening rounds of stop No. 3 of 5 in the SALSA Longboard surfing series and the first of the Coreban SUP races setting the stage for a grand finale and the Guinness World Record attempt on Sunday. The beach was a hive activity as Spin 4 Charity hosted spinning trials alongside talks on environmental topics by 350.org and others, spectators browsed through the incredible images on display by renowned photographer Nic Bothma, carbon footprints were calculated by CAPS, wind turbines and solar panels from 3rd Rock Energy were perused and free beverages were dispensed by Loaded Smoothies and Monster Energy. Greg Bertish won the first leg of Coreban SUP races, powering around the ‘M’ shaped course to finish ahead of Ivan van Vuuren, Jono Rosslind and Justin Bing. Craft of all shapes and sizes were demonstrated, including an incredibly light, streamlined Kevlar racing model that drew plenty of attention. Former SA champion Dylan McLeod (PE) advanced to semi-finals of Open division of the longboard event, as did Rosslind, who is competing in both events, and Durban’s Brad Weare. PE surfers Faye Zoetmulder in the Women’s event and Grant Beck in the Juniors will also be contesting their respective divisions on the final day. Wavescape, the official online and surf forecasting partners of Earthwave, predict light cross-offshore winds for Sunday morning and Kahuna Promotions, organisers of Earthwave and the Guinness World Record for the most surfers riding on the same wave, are optimistic that the record of 110 set at last year’s event can be raised even higher. Registration for the GWR event starts at 10am and the hundreds of participants are expected to line up on the beach at 12.30 before paddling out for the one hour attempt at 1pm. Approximately six to eight waves are expected to be ridden in the 60 minutes. While an attempt is made to count the surfers on each wave, it is photographic evidence that provides the final proof of how many surfers are up and riding five seconds after taking off. 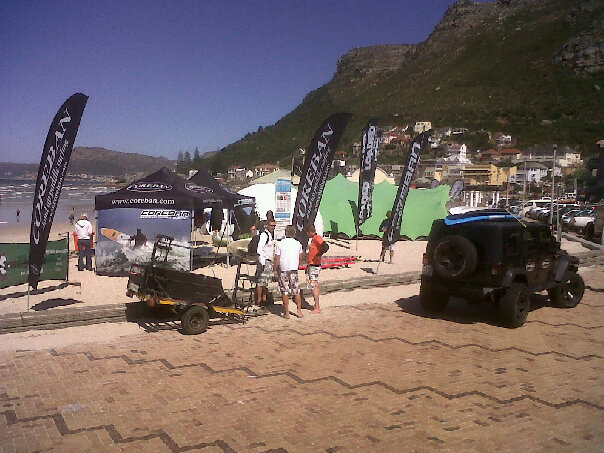 The official figures for the day will be announced at the Corona Earthwave After-Party at the Brass Bell in Kalk Bay. The party starts at 5pm and features surf band the Little Kings, promos, the draw for the raffle and an auction of eco friendly items from Aidan Bennetts Design. This year there is a R10 cover-charge, the entire proceeds of which will be split between Spin 4 Charity, the Sunflower Fund, who will also be selling their Bandanas on the each during the day, and the Shark Spotters program which will have additional staff on duty during the GWR attempt. The Earthwave Beach Festival offers fun in the sun for people of all ages, including a Dig for Gold with 50 valuable prizes ranging from branded wetsuits and sunglasses to apparel and footwear buried in the sand. The Earthwave Beach Festival is supported by Loaded Smoothies, Kustom footwear, Aidan Bennetts Design, Derevko Wetsuits, Hemporium, O’Neill, Caves Surfwear, Billabong, VonZipper, New Balance, Palmers, Zigzag, Empire Café, Rafikis and Octopus’s Garden, Bulk SMS, Compass Bakery, Monster Energy, Surfing South Africa and Corona. Contact kahunasurf@mweb.co.za for details on how to become part of this sustainable lifestyles initiative. There will be action aplenty at the Earthwave Beach Festival at Muizenberg this weekend as Cape Town’s surfers try to break the Guinness World Record of 110 riding on the same wave alongside talks and displays on environmental issues, a photographic exhibition, contests for Longboard surfers and Stand Up Paddleboarders (SUP) and fund raising for worthy causes, before reaching a climax at a huge after-party on Sunday evening. The fourth annual Earthwave event also features plenty of activities for youngsters, including a Dig for Gold with thousands of Rands in prizes, development surfing, a survey on starting a local surfers environmental organisation, calculating your carbon footprint, a tourism quiz with prizes, free books and CD’s on sustainable lifestyles, free beverages from Loaded Smoothies and Monster Energy and loads of give-aways, sticker showers and competitions. The highlight will be the Guinness World Record attempt on Sunday, when even more than the 443 surfers of all ages who set the record last year are expected to take to the surf in sunny weather and ideal one metre rolling waves. Registration of participants starts at 10am and all participants line-up on the beach in a spectacular display of the diversity of the surfing lifestyle at 12.30. Entering the surf at 12.55, half a dozen or more attempts will be made between 1pm and 2pm to get more than 110 surfers riding the same wave for 5 seconds or more. This all takes place under the watchful eye of the Shark Spotters (who will have additional staff on duty), a pair of Billabong / Monster Energy Jetskis in the surf and the reassuring presence of a flotilla of NSRI craft behind the break while highly trained paramedics from Medics in Motion and also the local Lifeguards are on-hand for any eventualities on the beach. The Ticket to Ride Foundation will be bringing 15 rookie surfers from Masiphumelele to participate in the record attempt. Using surfboards and wetsuits kindly provided by Surfing South Africa as part of surfing’s national controlling body’s transformation program, which is supported by Sport & Recreation SA and the Lotto, the youngsters will also enjoy a hearty meal donated by Compass Bakery. The festival gets underway at 8am on Saturday with a nationally rated Longboard surfing event run by the WP Longboard Club that has attracted top exponents from all over the country where the winners will be crowned on Sunday morning. The Coreban SUP races run between 10am and 12noon on both days and will utilise an ‘M’ shaped course through the surf that ensures spectators will be close to the action in this burgeoning watersport discipline. All-day activities on both days include the works of renowned photographer Nic Bothma who will be displaying images from previous Earthwave events and also big-wave action around the Peninsula. There is also the opportunity to get some exercise and raise some funds for Spin 4 Charity, who will be conducting trials for the their own 24 hour Guinness World Record attempt at next year’s Earthwave festival. Well known environmental organisations such as 350.org and the 90 x 2030 Project will be presenting talks on climate change and sustainable lifestyle options and 3rd Rock Energy will display solar and wind turbine energy generators. The Climate Action Partnership will calculate your carbon footprint, with prizes for those with the lowest impact on the environment, and there will also be a display and information on marine creatures by Save Our Seas and the Shark Spotters. The event is supported by the City of Cape Town with the Environmental Resource Management Dept have providing copies of their excellent Smart Living Handbook in print and digital versions for those seeking the best way to Reduce, Reuse and Recycle, along with copies of their guide to Western Cape Beaches. And Cape Town Tourism will be hosting a quiz with prizes just after 12noon on Saturday. Spectators and participants alike can show their support for the meritorious efforts of the Sunflower Fund on behalf of leukemia sufferers by purchasing a Bandana at Earthwave and wearing it during the world record attempt. Earthwave is supported by Loaded Smoothies, who will be dispensing their range of delicious and nutritious health drinks to participants and spectators, and will distribute tens of thousands of Rands of branded products in competitions, a raffle and competitions. Products up for grabs include top-of-the-range footwear from Kustom, chairs using environmentally friendly materials designed by TV personality Aidan Bennetts, top-class Derevko Wetsuits, Hemporium bags and apparel made from environmentally friendly hemp, clothing and accessories from O’Neill, Caves Surfwear and Billabong, sunglasses from VonZipper, shoes from New Balance and surf wax from Palmers. There are also magazines from Zigzag, vouchers from top restaurants such as the Empire Café, Rafikis and Octopus’s Garden, a year’s subscription of surf forecast SMS’s from Wavescape and Bulk SMS and much, much more. The 2010 Earthwave Beach Festival culminates in the Corona Earthwave After-Party at the recently renovated Brass Bell in Kalk Bay starting at 5.30pm on Sunday. Starring surf band Little Kings, the after party will also feature the Corona promo-girls, surf movies from the Wavescape Film Festival, more prizes and give-aways and the announcement of the official number of surfers on one wave earlier in the day. For further information see the Program of Events at www.kahunasurf.co.za/kp/earthwave-2010 and the Facebook group Earthwave Beach Festival 2010 where video footage on how seriously participants train for the event, produced by the Fabulous Boomtown Boys, can be viewed. The Earthwave Beach Festival is produced by Kahuna Promotions and proudly supported by Wavescape, the official online and surf forecasting partner for Earthwave. KERAMAS, Bali/Indonesia (Wednesday, September 29, 2010) -The Oakley ASP World Pro Junior, the opening stop on the 2010 ASP World Junior Tour (WJT), will commence its waiting period this weekend in Bali, ushering in the greatest assemblage of junior surfing talent from around the globe. Surfing young guns Conner Coffin (USA) and Keala Naihe (Haw) will challenge the world’s best junior surfers in arguably one of the world’s best high-performance waves after being awarded wildcards into the high stakes event, which will run at Keramas from October 2-13 and offer a prize pool of US $95,000. With a surfing attack built on power and topped with an increasingly progressive repertoire, Coffin, 17, is looking to add to his trophy case with a big result in the tournament. Coffin, who has an amazingly smooth, clean, and powerful pointbreak style, was raised in Santa Barbara’s legendary point breaks, and should ultimately put him in good stead at the right-hand waves of Keramas. In Round 1, Coffin will come up against Kiron Jabour (HAW) and Chris Salisbury (AUS). Naihe is also positioned well for an impressive showing at the prestigious tournament and will face Marc Lacomare (FRA) and Charles Martin (GLP) in Round 1 of competition. Ronny Nelson, Oakley Sports Marketing Manager, is excited to see Conner and Naihe lineup in the event. “Choosing wildcards is always a hard thing to do, there are so many options out there but at the end of the day you need to look at who will do well or even win the event,” he said. “In my eyes, I feel that Conner and Keala will best represent Oakley and have a great chance to win. Conner’s explosive surfing in punchy waves will be his advantage while the smooth finesse surfing and knowledge of reef breaks will suit Keala in Bali. Oakley is really happy that Conner and Keala are competing in the first event of two to help crown a legitimate ASP World Junior champion. Similar to years past, athletes compete on their respective regional ASP Pro Junior Series throughout the season to qualify for the ASP World Junior Tour. Qualification for the ASP WJT is based on regional results from January 1 through August 31, 2010. The inaugural ASP World Junior Tour will see six representatives from ASP Australasia, ASP South America, ASP North America and ASP Europe, five representatives from ASP Africa, ASP Hawaii and ASP Japan, and additional wildcards to make up the 48-man field. The ASP World Junior Tour events will also feature an 18-woman field, which will crown the undisputed ASP Women’s World Junior Champion. The undisputed ASP World Junior Champions will be the No. 1 ranked male and female surfer after the completion of the ASP World Junior Tour. LOWER TRESTLES, California/USA (Saturday, September 18, 2010) – Kelly Slater (USA), 38, past nine-time ASP World Champion, has taken out the 2010 Hurley Pro at Trestles in flawless six-foot (2 metre) waves over lethal Australian Bede Durbidge (AUS), 27. Event No. 6 of 10 on the 2010 ASP World Tour, the Hurley Pro at Trestles culminated in stunning fashion today with the iconic Floridian collecting an unprecedented 43rd elite tour victory. Today’s win, his fourth elite tour win at Lower Trestles (2005, 2007, 2008 and 2010), vaults Slater into the ratings’ lead in his hunt for an unprecedented 10th ASP World Title. Slater, who was relegated to Round 5 by Australian Owen Wright (AUS), 20, in Round 4, capitalized on the newly-implemented double-elimination round and sprung back with a vengeance after earning a free pass to the Quarterfinals after his opponent, Davidson, was too ill to compete. For today’s efforts, Slater was awarded the biggest prize purse in surfing history, US$105,000, as well as the ASP World Title Race ratings’ lead. Bede Durbidge (AUS), 27, who defeated Slater at this event in 2006, was unable to repeat the magic this year, but was ultimately thankful for his Runner-Up finish. 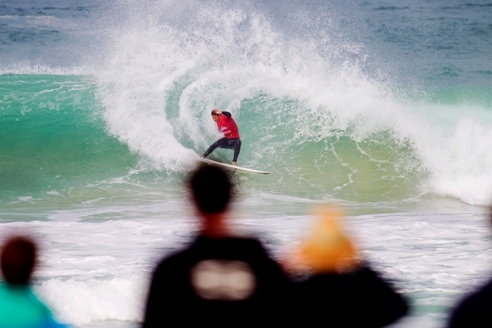 Durbidge’s charge to the Final was no easy task however, as the current ASP World No. 8 ousted current ASP World No. 2 Jordy Smith (ZAF), 22, in their Quarterfinals matchup and Dane Reynolds (USA), 25, in the Semifinals before falling to Slater in the Final. Mick Fanning (AUS), 29, reigning ASP World Champion and defending event winner, was near flawless throughout the Hurley Pro at Trestles, consistently netting high scores with unrivalled speed and power. However, the Australian’s form fell short in his Semifinal against eventual winner Slater, as he finished Equal 3rd and moved up to No. 5 on the ASP World Title Race rankings. Dane Reynolds, current ASP World No. 4, continued to exhibit his brand of mind-blowing, progressive surfing at Lower Trestles. A consistent high-scorer throughout the event, Reynolds failed to surpass Durbidge in their Semifinal bout, but remained grateful at the opportunity to surf waves of such quality. Jordy Smith, into his third season on the elite ASP World Tour, was one of the form surfers of the event this year. However, after suffering two broken boards yesterday, the young South African was unable to overcome Durbidge in the Quarterfinals. With his Equal 5th place finish, Smith retains the ASP World No. 2 spot heading into the European leg. The next stop on the 2010 ASP World Tour will be the Quiksilver Pro France from September 25 through October 5th, 2010. Momentum is building for the Guinness World Record attempt for the ‘most surfers riding the same wave’ that will be staged at the Earthwave Beach Festival in Muizenberg on the weekend 25 & 26 September. The festival offers a full program of events over the two days including a nationally rated Longboard surfing contest, Stand Up Paddleboard (SUP) races in the waves, plenty of beach activities for all ages, talks and demonstrations on environmentally sustainable topics and products, with the highlight being the attempt to get more than 110 surfers to ride the same wave for more than five seconds. Supported by Loaded Smoothies, who will be dispensing their range of nutritious health drinks to participants and spectators, Earthwave also provides a forum for organisations such as Spin 4 Charity, the Sunflower Fund and the Shark Spotters program to raise awareness and funds for their worthy causes. Tens of thousands of Rands of branded products will be given away, raffled, auctioned and won in activities like the popular Dig for Gold, beach cleanups. Prizes include Kustom footwear as worn by Joel Parkinson and other world and world-class surfers, environmentally friendly furniture items designed by TV personality Aidan Bennetts, Derevko Wetsuits, Hemporium products, New Balance shoes, apparel and accessories by O’Neill and Caves Surfwear and many more. The Corona Earthwave After-Party will showcase the newly revamped Brass Bell in Kalk Bay where surf band the Little Kings, promo-girls, surf movies from the Wavescape Film Festival and more prizes and auctions, including five cases of Mexico’s favourite beer, will ensure a riot of fun and mayhem from 5pm until late on the Sunday evening! The SUP races, organised and run by Coreban International, will use an ‘M’ shaped course that sees competitors paddling in and out through the waves twice in each heat, a first for Muizenberg. With valuable prizes at stake, the entire event will be completed on the Saturday. 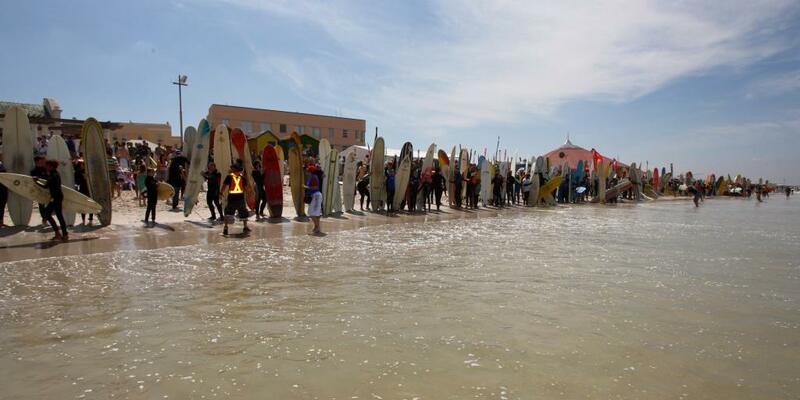 The longboard surfing event, run by the WP Longboard Club, is stop No. 3 of 5 on the inaugural SA Longboard Tour and features a number of the country’s top performers. Starting on Saturday morning, the finals will be held on Sunday morning with the awards presentation staged just before an expected 500 or more participants line up to break the Guinness World Record at 12.30pm. The SUP and longboard competitors and participants in the Guinness World Record attempt, who can include anyone who can stand up and ride a wave for five seconds or more, will be fueled by Monster Energy who will also be providing stickers, tattoos and other promotional items for all attending the festival. Registration for the GWR starts at 10am on the Sunday and those wishing to be part of record breaking attempt are advised to check in early to prevent parking hassles and avoid the rush before the lineup. Entry costs R50 and all participants need to sign an indemnity form (signed by a parent/guardian for those under 18) and provide an email address to which an official certificate of participation will be sent. For further information see www.kahunasurf.co.za/kp/earthwave and the Facebook group Earthwave Beach Festival 2010. The fourth annual edition of the event is produced by Kahuna Promotions and proudly supported by Wavescape, the official online and surf forecasting partner for Earthwave. LOWER TRESTLES, California/USA (Sunday, September 12, 2010) –Day 1 of the Hurley Pro at Trestles went off with clean three-to-four foot (1.5 metre) waves rolling through one of the world’s most rippable waves in Lower Trestles and the newly-minted ASP Top 34 took elevated the performance level yet again. Event No. 6 of 10 on the 2010 ASP World Tour, the Hurley Pro Trestles completed Round 1 and the opening 5 heats of Round 2 today, with the world’s best surfers taking to the Trestles canvas with reckless abandon. Dane Reynolds (USA), 25, current ASP World No. 4, stumbled in the opening heat of the morning, losing to an in-form Chris Davidson (AUS), 33. Despite his relegation to the elimination Round 2, Reynolds put in a sensational afternoon performance, blending backhand fin-free maneuvers with a brutal forehand assault to collect the highest heat total of the event, a 17.70 out of a possible 20, to dispatch lethal, local wildcard Kolohe Andino (USA), 16. Jadson Andre (BRA), 20, 2010 ASP Dream Tour rookie and current ASP World No. 11, took out his first elite career win earlier this year in Brazil, and continued to exhibit the form that has made him one of the most exciting surfers in the world. The fleet-footed South American executed a number of high-risk aerials on his forehand to net a 17.03 out of a possible 20, taking top honors for Round 1. Mick Fanning (AUS), 29, reigning ASP World Champion and current ASP World No. 9, survived a hard-fought Round 1 heat this morning, scoring an excellent 8.67 in the last 10 minutes before backing it up and taking the win. Taj Burrow (AUS), 32, current ASP World No. 3, took out a convincing Round 1 victory over local Patrick Gudauskas (USA), 24, and newly instated ASP Top 34 member Gabe Kling (USA), 30, with some impressive surfing on his backhand. Jordy Smith (ZAF), 22, current ASP World No. 1, posted a confident Round 1 win this morning, manhandling the performance-oriented Lowers lefts and rights to advance directly to Round 3. Currently the frontrunner in the race for an inaugural ASP World Title, Smith maintains his focus on the present. South Africa’s Travis Logie was a first day elimination, along with wildcards Kolohe Andino and veteran Rob Machado, current ASP No. 8 Bobby Martinez (all Californians) and ASP No. 12 Fred Patacchia (HAW) as the streamlined format enabled the organisers to run five heats of Round 2. Logie placed third behind Fanning and Taylor Knox (USA) in Round 1 and was then ousted from the event by former ASP World Champion CJ Hobgood (USA) in Round 2. Kelly Slater (USA), 38, past nine-time ASP World Champion and current ASP World No. 2, scored a confident win in his Round 1 bout this morning. Currently in the process of hunting an unprecedented 10th ASP World Title, Slater has also been a big supporter of the recent changes made at the ASP World Tour level. Surfline, official forecasters for the Hurley Pro Trestles, are calling for the swell to dip over the next couple of days before a stronger swell system moves in on Thursday, Friday and Saturday. Event organizers will reconvene at 7am to assess conditions for a possible 8am start. When competition resumes, up first will be Owen Wright (AUS), 20, up against Luke Munro (AUS), 27, in Heat 6 of Round 2. Durban (Sunday 12 September 2010) – Surfers riding Safari Surfboards shaped by master-craftsman Spider Murphy bagged two Gold and one Bronze medal at the ISA World Masters Surfing Championships which concluded in Panama on the weekend. Chris Knutsen and Heather Clark successfully defended their Grand Kahunas (Over 50) and Women’s Masters (o/35) titles while David Malherbe placed third in the Kahunas division (o/45). ‘Knutto’, the only surfer in the 42 year history of SA surfing to have won the SA men’s title four times, went unbeaten throughout the 2010 ISA Masters and scored the only perfect 10 point ride of the entire event on his way to victory in the final. The 53 year-old from Durban added a third ISA World Masters gold medal to his tally following his triumph in the Grand Kahunas in Peru in 2008 and in the Kahunas in Puerto Rico in 2007. ‘Fergie’, SA’s ‘Queen of surfing’, completed an astonishing recovery from a life-threatening motor accident in October last year to add the 2010 gold medal to the one she earned in Peru in 2008, the first time the Women’s masters division was included in the event. A former ASP Women’s World Tour campaigner and still the only SA surfer ever to win the Hawaiian Triple Crown of Surfing, Heather has won every heat she has contested in two ISA Masters events. ‘Herbie’, the ASP World Pro-Am champ back in 1990, the SA men’s champ in the mid ‘90’s and a multiple SA Masters champion, took the bronze medal in Panama, going one step better than his copper medal for fourth place in the Grand Masters in the inaugural event in Puerto Rico. The trio, who arrived back in South Africa late last week, have all been collaborating with Spider for many years while riding to victory on Safari Surfboards. Chris is currently riding Spider’s new Hydro X model which is receiving critical acclaim across South Africa and globally. A host of top-class performers are claiming it is 20% faster and more maneuverable than any surfboard previously ridden! Safari Surfboards was established in 1963 and is the exclusive provider of Spider Murphy’s shapes. Contact boards@safarisurf.com for more information.